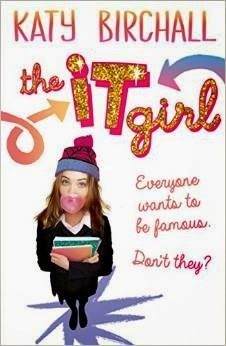 I recently read and really enjoyed The It Girl by Katy Birchall. I was lucky enough to hear a little bit about this book from the author at a recent book event and it was really interesting to listen to Katy talk about her own personal experiences that went into writing this story and how she went about it. She also read aloud an excerpt and it was absolutely hilarious. So I was always going to be excited to read it. And The It Girl didn't disappoint when I read the full story. It was funny and sweet and had a really great message about friendship and being okay with you are and how there are more important things that popularity or fame. The It Girl tells this story together with emails and voice mails about a 14 year old girl called Anna and her life in London with her father and her dog, called Dog. It sort of starts out as Anna has started a list of her aims in life. And these goals include training Dog to high five but also to figure out stuff so that she isn't such a social outcast in the things that she does. This is sort of eclipsed half way through the novel when she finds out that her father is currently dating a rather famous actress and the media dub Anna an 'it girl' and Anna really struggles with this new fame and attention that she is receiving. I love stories like The It Girl. It's been done before, with The Princess Diaries by Meg Cabot and Geek Girl by Holly Smale. This fairy tale story of a normal girl thrust into the spotlight is an interesting and always fun story line annd Katy Birchall's story is just as entertaining. Anna's story is filled with hilarious and embarrassing moments. It starts off with Anna coming home from school after accidentally burning the most popular girl at school's hair and some rather frantic interactions between her and her best friend. And some of the real strong points in the novel were Anna's friendships and her relationships with the people in her life. Particularly that of her relationship with best friends, Jess and Danny. But also her relationships with boy her mother and father. And also this burgeoning relationship with her future step-sister and actual It Girl, Marianne. I thought this relationship between Anna's mum and dad was wonderful and very unusual. I really loved Anna as a character. She's awkward and nerdy and she's still figuring stuff out. She has an idea at the start of the book of what she wants out of life and friendships and relationships and because of this she makes some mistakes and bad choices along the way. I liked that about her and I liked how she developed over the course of this book. The It Girl was all kinds of funny. I recommend that you pick it up for that reason alone but hopefully you'll also take away from this book some amazing characters and friendships and a rather lovely message. Really looking forward to book 2 now!